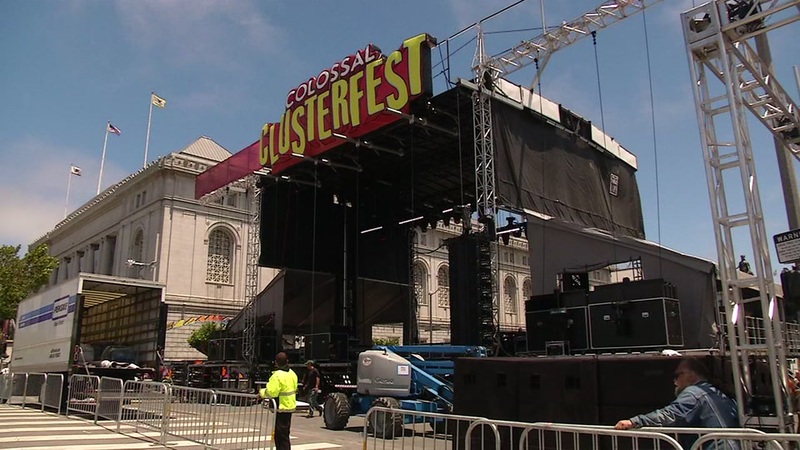 SAN FRANCISCO (KGO) -- Thousands of comedy fans are pouring into San Francisco's Civic Center Friday night for the beginning of Clusterfest. ABC7 News got a behind-the-scenes look at the stage and exhibit areas for the three-day festival. One of the most memorable exhibits could be inside the Bill Graham Civic Auditorium, where a team from "The Daily Show" have set up the Donald J. Trump Presidential Twitter Library. They say visitors can compose their own tweets from a presidential throne. Or, at another station, they can type in their information and be assigned a Twitter nick name, just like the president gives his opponents. "Donald Trump has a way of giving you a nick name and it sticks for life. I'm convinced that Ted Cruz's grandchildren will call him lying Ted," Daily Show Correspondent Roy Wood Jr. said. The festivals will feature a slate of rising young comedians along with stars like Jon Stewart and Trevor Noah from "The Daily Show." The festival will also partner with local Bay Area chefs and a portion of ticket sales will be donated to San Francisco organizations such as Downtown Streets Team, Larkin Street Youth and the Tenderloin Museum, festival organizers said.